Special Edition Collector Prints Sold Exclusively at Icebox Gallery. Early Photographs of Bob Dylan by John Cohen. • Two Limited Edition Show Posters celebrating the 2006 Icebox Exhibit. • Published and printed by Icebox Gallery in the month of May 2006. • Limited Edition /100 signed prints and 10 Signed Artist Proof Prints. • Edition of 100 Signed and numbered prints of each of two posters. • Printed on thick 308 g/m2 Hahnemuhle Fine Art Photo Rag. • Printed using a Epson printer and quality Epson inks. • Both posters where designed by Margo Cavis. • Each print is signed and numbered by John Cohen in pencil. • Print 1 “Bob Dylan in my loft” This image was first exposed in April 1962. The picture was made in John Cohen’s loft in Greenwich Village, N.Y. 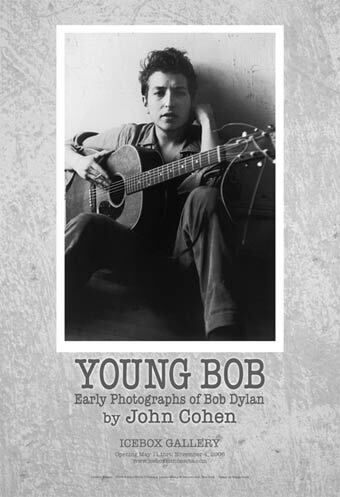 This classic image is published on page one of the Young Bob book. Power House 2003. 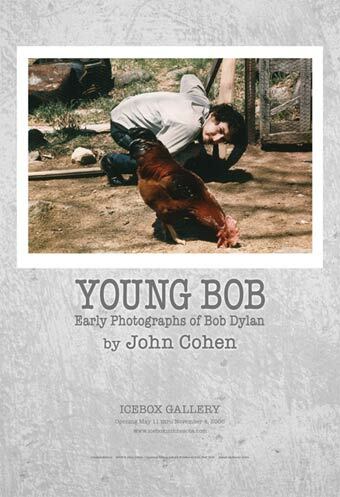 • Print 2 “Bob Dylan with a Chicken” This image was photographed Circa 1970 at John Cohen’s farm in Putnam Valley, New York. First published in reverse inside spread of Bob Dylan’s Self Portrait record album. Columbia Record released in 1970. This extremely rare color image was scanned directly from the only known Type C Print still in the photographer’s personal collection. Poster sizes: 13" wide by 18.5" Tall.